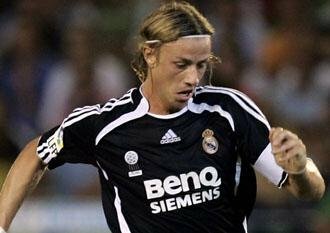 Guti: "I wish to leave Madrid"
According to statements forwarded to AS courtesy of Canal+ in a recent recording of the Canal+ 'Robinson Report' which is to be aired on Thursday 28th at 22:00, José María Gutiérrez Hernández, midfielder for Real Madrid, commonly known as “Guti” was said to be more sincere than ever. At one point in the interview, Michael Robinson asks, "Is there football for Guti after Real Madrid?” In a lukewarm beginning he responded, "I would like to end my contract at Real Madrid but it is also true that I would like to be able to play for another team, to be able to enjoy another culture, other peers, another league”. While Guti was speaking of a life away from Madrid, Robinson made the observation: "I know that there are people in Inter Milan who will receive you with open arms." Guti´s reply was sincere: "I would go with open arms. It is a great club. I have great friends there, Samuel Etoo and Wesley Sneijder. I think it's a team that can aspire to anything. The truth is that if it was a reality it would be one of my best options. It is true that I´ve had a great time at Real Madrid, Madrid is a city where I have wanted to live all of my life, and now I wish to leave Madrid. It's like a contradiction but I cannot wait to get out of Madrid, to be in another country, in another city and to enjoy other things. " He's always welcome at the Mighty STOKE! Failing that Marbella could do with a decent footballer as well.